This is one of the most reliable company among Japanese suppliers. Regarding its sales history, clients were never let down and always found a good vehicle for themselves or their clients. Vehicles sent are strictly same as the information displayed on their webiste. If a problem is to be mentionned, their staff will let the clients know every time before closing the deal. Maybe the highest reply speed on the web. Clients are contacted less than 24h after sending their request. Late at night or early in the morning, they always have staff available. You can leave your phone number and email address with your enquiry if you want them to reply shortly. The team is always ready to negotiate prices and find a win-win agreement with clients. Do not hesitate to solicit them and dicuss about prices of the vehicle they displayed. If you are looking for trucks or commercial cars you will find online a broad selection of Toyota, Nissan, Mazda, Mitsubishi, Isuzu, Hino… Hundreds of models are available. And if you don't find exactly what you wanted you can still let them know and they would get it for you. TOYOACE was developed after the Pacific War and introduced to the market as a low priced mini 4WD truck. At the time, 3-wheeled automatic trucks dominated the market. However, TOYOACE in no time became the revolutionary model that switched the small truck market trend to 4WD from 3-wheeled vehicles. At the time, the truck market made up most of the automobile industry, so the TOYOACE was a sensational event for everyone in the business. Many years later, TOYOACE is still being produced and is recognized to be the iconic model of small Toyota trucks. The name TOYOACE was decided by a public vote in 1956. The word is made up from “ACE (Pioneer, best)” and “TOYOTA”. Furthermore, DYNA comes from the word, “dynamic”. 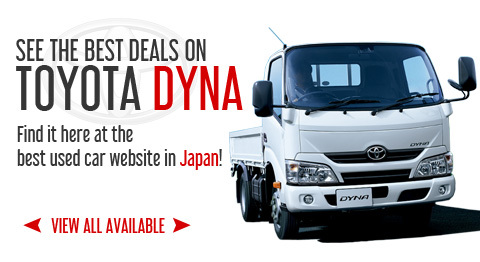 The only difference between a TOYOACE and a DYNA is the front grill and the sales channel in Japan. The model number is the same, so they are really the same product.